Raise your hand if you are a fan of the stock AOSP Gallery application? A couple of you? None of you? Many of you? This is one of those applications we rarely talk about for whatever reason, but if you ask me, I’d argue that it is one of the last remaining neglected apps that still seems to be hanging on to visions of years past. Thankfully for us and the app itself, it is on the verge of being phased out for the Google+ Photos app, so we’ll likely never see it get a 2014 stamp of Google design approval. 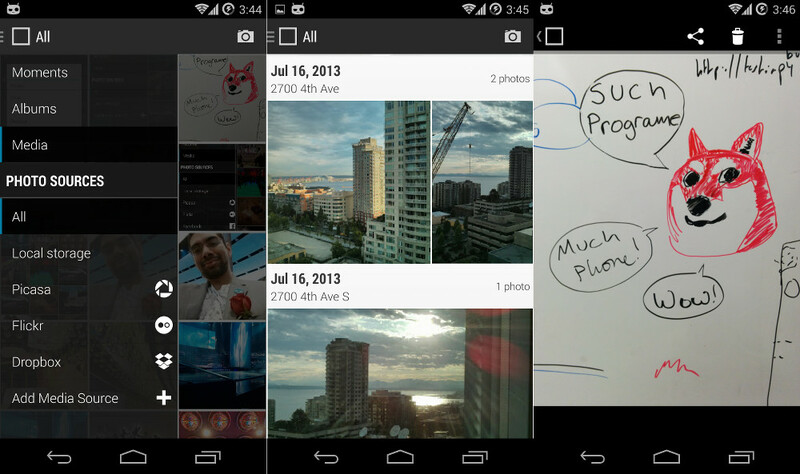 The CyanogenMod team seems to agree and has created their own new gallery app called GalleryNext. For now, it’s in beta and available for testing, but we would imagine that in the future, it will ship with CM builds. The app looks somewhat like a blacked-out version of the G+ Photos app with its slideout navigation menu and mini-gallery compilations. What makes it unique and extra useful, is the cloud service integration that has been built in for your photos on Flickr, Picasa, Facebook, and Dropbox. You’ll also find GIF support, video playback support, and “Moments” support (grouping of photos based on metadata). As you can imagine with the app in beta, there are things that need to be done to improve it. The CM team already has a list in the works, but should you become a part of the beta test, be sure to submit issues and requests as they come up.